An architectural superstar of its time. And now? The Civic Arena can still pack ’em in. It was standing-room-only last week at the Pittsburgh Historic Review Commission meeting on Ross Street, just down the hill from the vacated hockey palace. Some very smart people made a polished and impassioned presentation that showed the 49-year-old Igloo to be an architectural superstar, an engineering marvel and the symbol of Pittsburgh’s Renaissance, rising just as the city’s skies were clearing. What nobody offered, though, is what practical use it has now. In the past quarter-century, three multipurpose arenas of ascending size — the 5,400-seat Palumbo Center, the 12,500-seat Petersen Events Center and the 19,000-seat Consol Energy Center — have been built within two miles of the place. This city needs another arena like it needs a hole in the Hill. To be fair, it wasn’t the job of preservationists this day to offer a practical new use for the empty building. The question was whether the Civic Arena should be designated a historic structure. But if the commission votes next month to grant historic designation (preliminary approval last month is no guarantee), that would prevent the city-county Sports & Exhibition Authority from demolishing the arena. That would muck up the Penguins’ development plans for the 28-acre site, and the most prominent Hill District leaders don’t want those plans blocked. Residents have been waiting 50 years to get their neighborhood back. Both preservationists and those who want to see office buildings, stores and about 1,200 new homes built at the site agree on one thing: The way the Hill District was treated when the arena site was cleared in the 1950s was a civic crime. 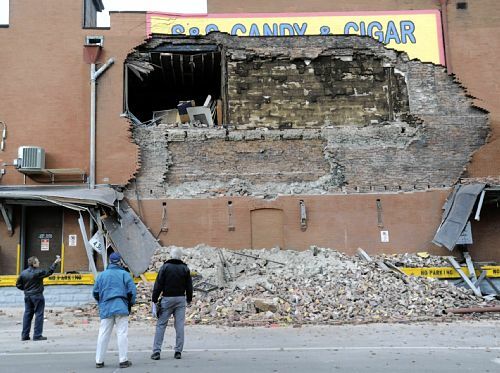 About 1,300 buildings, 400 businesses and 8,000 lower Hill residents got the heave-ho. Promises of better housing were never kept, and the highway ditches and largest park-for-pay lot in Western Pennsylvania are the neighborhood amputation scars. Mr. Pfaffmann even broke out a Rick Sebak video on the arena. (The video player, like the Igloo’s acoustics, went awry shortly.) But neither Mr. Pfaffmann nor the city’s premier architectural storyteller, Franklin Toker, could persuade Hill leaders that this mammoth steel assemblage would be anything but a humongous kink in plans to reknit the neighborhood into Downtown. This “case study of urban renewal gone wrong,” which isolated and divided the Hill, is “not the sort of history we wish to preserve,” Mr. Lavelle said. Preserving it, he said, would be like flying Confederate flags on state buildings in the South. Paying $50,000 a month to maintain it, or tens of millions of dollars to modify it for a new use, would not be a smart move for a strapped city, he concluded. What do you do with a spare arena? Modification plans all seem a bit like getting a bear to ride a bicycle. It can be done, but that’s not really what either bears or bicycles are for. What about saving part of it? TV actor David Conrad, in a videotaped presentation, said he understood why neighborhood residents want the arena erased, but saving a piece could “transform an insult into pride.” Preservation of a remnant would be akin to the iconic murals of saints, he said, which often show the martyred figures holding the very weapons that killed them. Sala Udin, who formerly held the council seat in the Hill, didn’t think the neighborhood would oppose a “remnant that stayed as some kind of icon.” But full preservation would block development plans. The Hill’s comeback has to be the primary goal. That started more than 20 years with the hugely successful Crawford Square townhouse development just east of the arena. With gasoline prices soaring, building another 1,200 new homes in the heart of the region is about the best news a shrinking city could get. The New Granada Theater is Granted National Historic Register Status! Congratulations to the Hill Community Development Corporation, the steward of the New Granada Theater historic preservation project. With the assistance of the Pittsburgh History and Landmarks Foundation, the New Granada Theater was granted National Historic Register Status by the National Parks Service on January 7, 2011! Having been stabilized with the assistance of the State of Pennsylvania and The Heinz Endowments, we look forward to the long, fundraising road ahead to renovate this historic institution as a multi-use, sustainable facility that pays tribute to its former uses, including that of a theater, office space, skating rink and even a car show room! To those who want to see it saved, the Civic Arena is an engineering marvel, an irreplaceable icon and a testament to Pittsburgh know-how. But to those who want to see it go, the arena is “more a symbol of genocide” than a civic treasure, an aging relic with bad pipes, lousy acoustics and high maintenance costs. 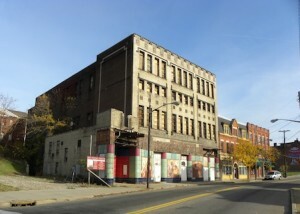 So it went for more than four hours Wednesday during a public hearing before the Pittsburgh Historic Review Commission to determine whether the 49-year-old landmark should be designated as a city historic structure. The commission, in a 5-1 vote last month, already gave preliminary approval to the designation, which would prevent the city-Allegheny Sports & Exhibition Authority from demolishing the building as part of a plan by the Pittsburgh Penguins to redevelop the site. It is scheduled to take a final vote next month. Preliminary approval is no guarantee the arena will survive. In 2002, the panel gave similar approval to the designation only to reject it in a final vote. Perhaps that’s the reason the nominator, Hill District resident Eloise McDonald, backed by Preservation Pittsburgh and Reuse the Igloo, and the SEA and the Penguins each spent more than an hour Wednesday advancing their arguments for or against designation. Ms. McDonald and her allies believe the arena meets six of the 10 criteria that make a structure worthy of designation, including its location as a site for significant historic events, its exemplification of a rare, unique or innovative architectural style, and its unique location and distinctive physical appearance. Only one of the 10 must be met to get a designation. 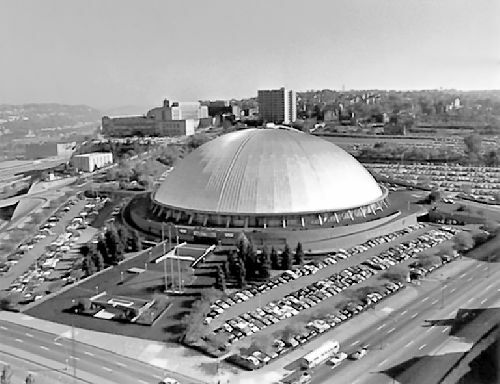 Franklin Toker, an architecture professor and the author of “Pittsburgh: A New Portrait,” argued that the arena “is, historically, the most representative building now standing in the city of Pittsburgh,” more so than the Cathedral of Learning, the county courthouse or the David L. Lawrence Convention Center. Others cited the arena’s retractable dome, one of the few in the world, or the engineering that made it work as reasons the old building should be saved. Shawn Gallagher, the SEA’s attorney, said the agency doesn’t believe the arena meets even one of the 10 criteria for nomination. He and others who support demolition said the arena requires millions of dollars in capital improvements, doesn’t meet accessibility standards and has no viable future as an entertainment venue. “It clearly is not worthy of preservation,” Mr. Gallagher said. 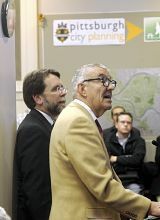 City Councilman R. Daniel Lavelle said the arena, for many in the Hill, represents failed public policy, one that destroyed homes and businesses and displaced thousands of residents. “This is not the sort of history we wish to preserve,” he said. And while some remember favorite concerts or exciting hockey games when they go into the arena, Hill resident Angela Howze recalls something else. “Every time I go in there I remember it once was my grandmother’s house,” she said. The Children’s Museum is $2.2 million away from raising the funds it needs to transform the sunken concrete square outside its doors into the Allegheny Public Square Park and make upgrades inside the museum. Officials Thursday announced they had raised $6.3 million of the $8.5 million needed and that the remainder would be solicited as public donations. The bulk of the money to date has come from foundations. A $250,000 challenge grant from the Buhl Foundation will match $1 for every $2 contributed by the public. The existing square was created in the 1960s as part of the Allegheny Center Mall. A sunken area housed a fountain encircled by amphitheater-like seating. The area now is a walk-through zone, sometimes used by skateboarders but otherwise ghostly. The museum chose San Francisco landscape architect Andrea Cochran in a design competition in 2007, when it embarked on its capital campaign. Ms. Cochran’s design for the new park calls for native plants, a meadow, 75 additional trees, solar lighting, a rain garden and a V-shaped walkway with benches and movable seats and tables. The park’s art feature will be a stainless steel sculpture by Ned Kahn. Called “Cloud Arbor,” the piece will stand as rows of stainless steel tubes with nozzles to create “a sphere of mist,” said museum executive director Jane Werner. “It is a companion to our wind sculpture,” called “Articulated Cloud,” which Mr. Kahn also designed as 43 panels on the building that create the illusion that the building is moving with the wind. A north-to-south row of cypress trees along Children’s Way will be kept while about 10 others will be replaced, said Ms. Cochran, adding that arborists had determined them to be unhealthy. “Everything we all say we care about — the environment, green space and kids — all comes together here,” said state Sen. John Pippy, R-Moon, a museum board member. The project’s budget will also cover alterations of the museum’s nursery, store and cafe. “We are hoping to break ground sometime this year,” said Ms. Werner. The project may be completed next year.